A number of Vietnamese students have jointly created an open resource with diverse materials intended to ambitiously bring about positive social change in the community. The students, all following the IPL Enlightened Leadership Program – a course with a full-tuition scholarship provided by non-profit liberal-education school OpenEdu Initiative, are planning these days to unveil a website with all their materials in mid-February. The site, ‘Cong Tri Thuc’ (Knowledge Hub), was their graduation project at the Vietnam-based education institution. In four groups of five or six people, the students were required to collect and translate at least 75 college lectures, 75 pieces of writing, 20 books and ten movies, with all the materials being about how to properly be a human, citizen, worker and leader. This means each member averagely handled 30 items in three months. The students had to ensure they made no copyright infringement and the materials were reliable and legally recognized. One of the groups has been able to build a network of 20 contributors willing to do translation and subtitling. Le Nguyen Tran Huynh, one of the students, said the group members divided the work amongst themselves not by material type but by topic. 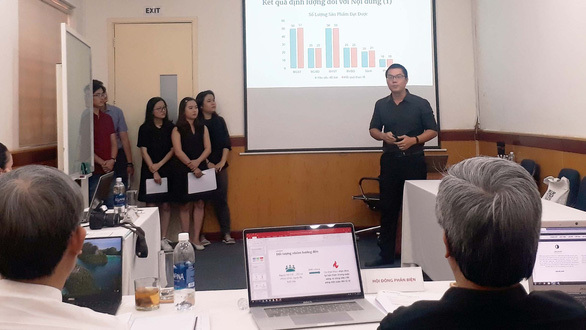 Another member, Van Thi Ngoc Dung, who is a consultant at Deloitte Southeast Asia, said her group decided from the outset that the website they were building should be useful to the community. The ‘Cong Tri Thuc’ website is expected to provide to the public materials that the students had found and translated, including subtitled videos and articles. Dung said the challenge from the project was great as the students, all under 30, were doing jobs at their companies. She spent two of the three months given traveling abroad on business trips but usually managed to fly back to Vietnam over the weekend to join the other members for group discussions.